The Timbuk2 Parker commuter bag is an excellent pack designed with function, durability and a sleek style in mind. This pack is a perfect size for your daily commute and urban errands. Not too big and not too small. 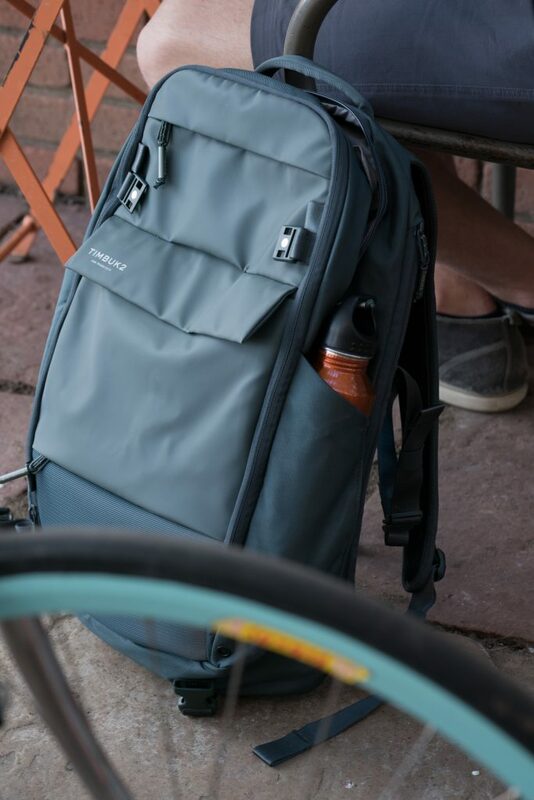 The Parker features both an internal and side-zip access to the laptop sleeve, which is very convenient, and an outer pocket that will fit your U-Lock if you choose not to use one of the side pockets. Some of the other well-thought features are a panel of reflective material along the bottom of the bag, quick magnetic closures on the outer “U-Lock” pocket and on the breast strap. There is also a zip-out expansion to add more storage space to the main compartment if need be, although this feature seems to really only dramatically increase space towards the upper half of the bag. Nonetheless, it could be handy to cram some extra stuff that you forgot at the office or picked up at the store on the way home. There are two side pockets with open tops that work well to carry a water bottle or your lock. And, of course, there is a retractable rain-fly at the bottom of the bag in case you get caught in some inclement weather. This bag sits very comfortably on your back and has sufficiently comfortable shoulder straps to make carrying your stuff a little more pleasant. There are two mesh bolstered pads running the length of the back of the pack on either side creating a chimney down the center to help with breathability. This is a nice touch, but really, I have yet to come across any bag that will actually keep you free of the back sweat-stains- especially if you are in a humid environment. But it’s there and it works about as well as it can. The construction seems to be quite solid and all of the materials are top quality rip-stop, cordura nylon and zippers. This bag is built to take the daily beatings of your commute and looks like it will last quite some time. This Timbuk2 Parker bag is a great bag and does exactly what it is designed to do- get your stuff around the town and look good while doing so. I don’t think I can find much I would change- If you’re one of those people that really love roll-tops, that might be the only thing, but I bet Timbuk2 already has another bag for that.. or several others..
Shop the Timbuk 2 Parker Bag on Outdoor Prolink. Not a member? Apply today! Dane Cronin began mountain biking in the woods outside of Boston in 1992 when cool anodized aluminum parts for bikes were all the rage. He knew Boulder was considered to be a mountain bike mecca and considered the University of Colorado Boulder as basically the only option for college. Over the years he worked in a number of bike shops in the Boulder area and taken full advantage of all the outdoor possibilities Colorado has to offer. Dane has been keeping the outdoor lifestyle dream alive by becoming a professional photographer shooting for a number of commercial clients in the outdoor and cycling industry mixed with a healthy dose of interior and architectural clients.